I have had the idea for a while to make a pair of slippers out of some left over scraps from a blanket that I made my mom a few years ago. 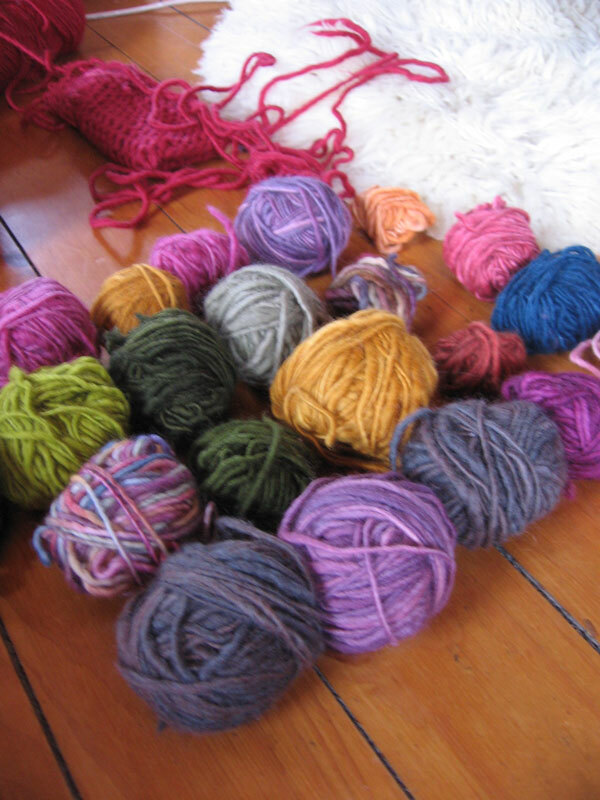 I carefully saved all the little balls of yarn in a plastic bin, in my old closet at my mom’s house. I was sick at home yesterday, and made a quick trip over to her house to raid the bin. I started with the sole. Made with scraps of of Lambs Pride yarn. 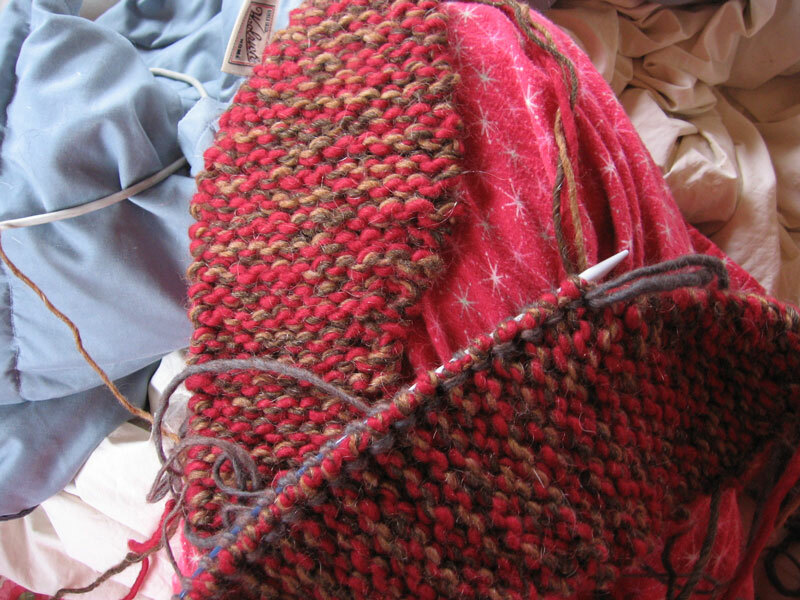 Two strands of worsted (different browns), and one strand of bulky (red). The idea for the sole pattern was inspired by a pair of slippers designed by my friend Emmy. 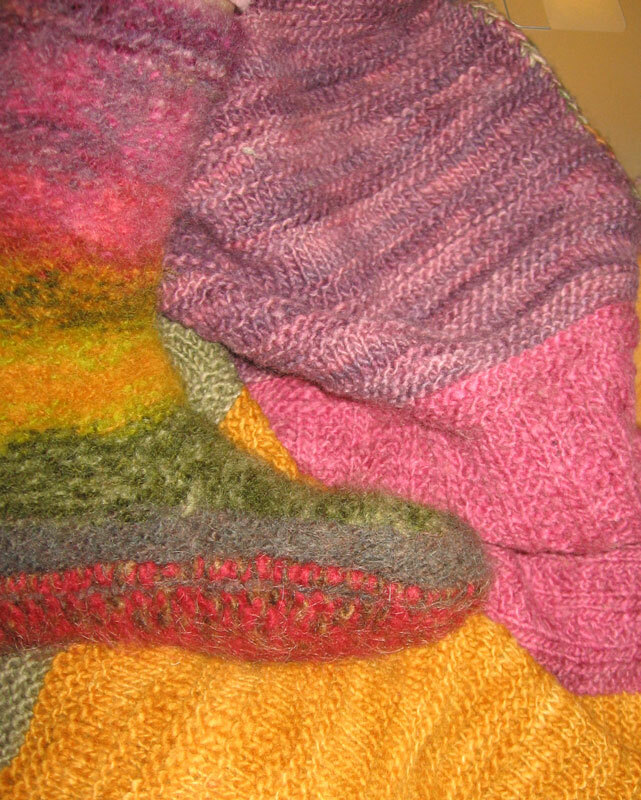 I did make a left and right sole though, following the shape of my feet as I knit the pieces. To make the rest of the slippers, I organized my scraps into even piles. To do this, I used my handy dandy kitchen scale. 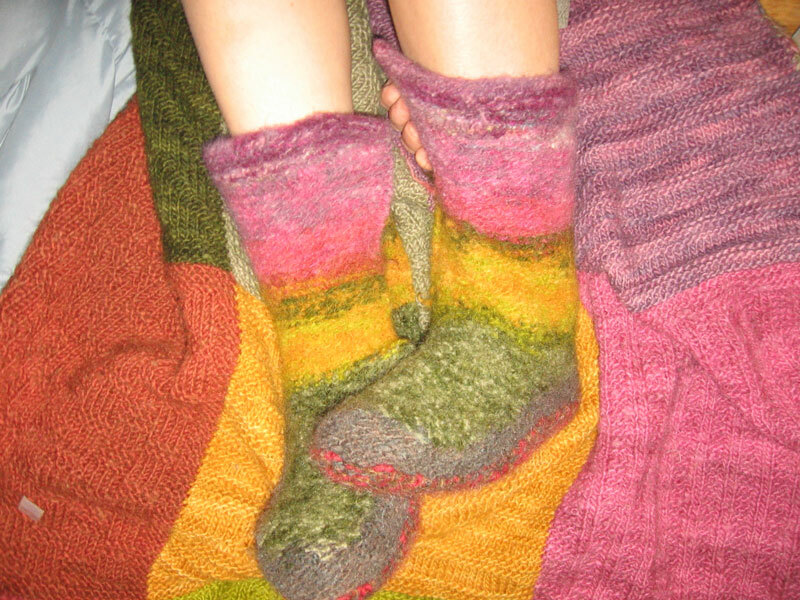 I weighed each ball of yarn so that the two slippers would be approximately the same (stripewise). 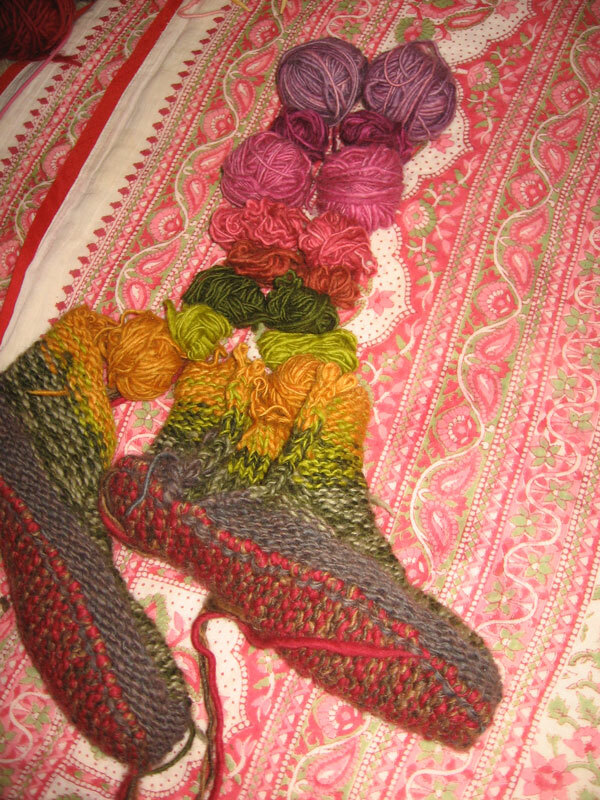 All the scraps for the tops of the slippers are from the blanket and are Manos del Uruguay yarns. A beautiful kettle dyed wool, and one of my favorites for felting because of the beautiful texture it produces once felted. I picked up and knit the stitches around the base of the slipper, and then worked across the top, decreasing to shape for the top of the foot and instep. It took a bit of trial and error on the first slipper, and then I just needed to remember what I did for the second…there might be a few discrepancies. 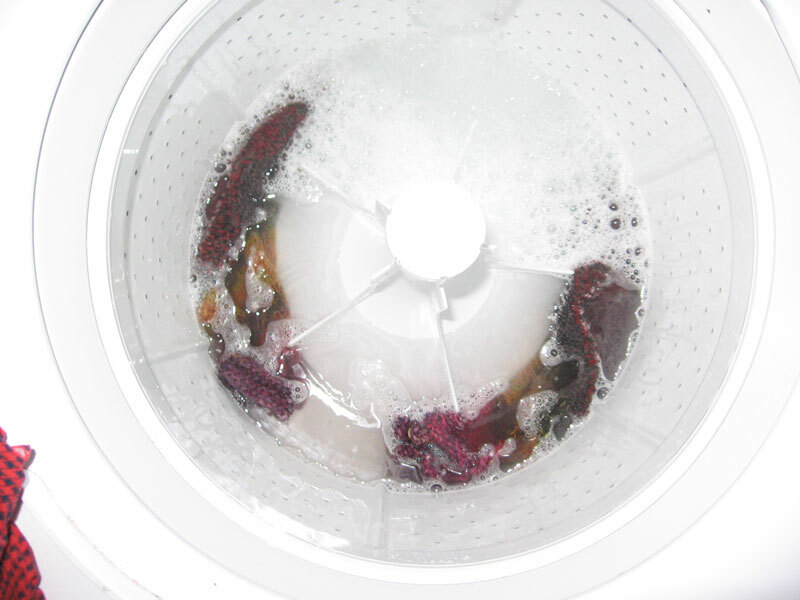 I popped the slippers into my top loading washer, on high heat, high agitation wash for about 10-12 minutes. 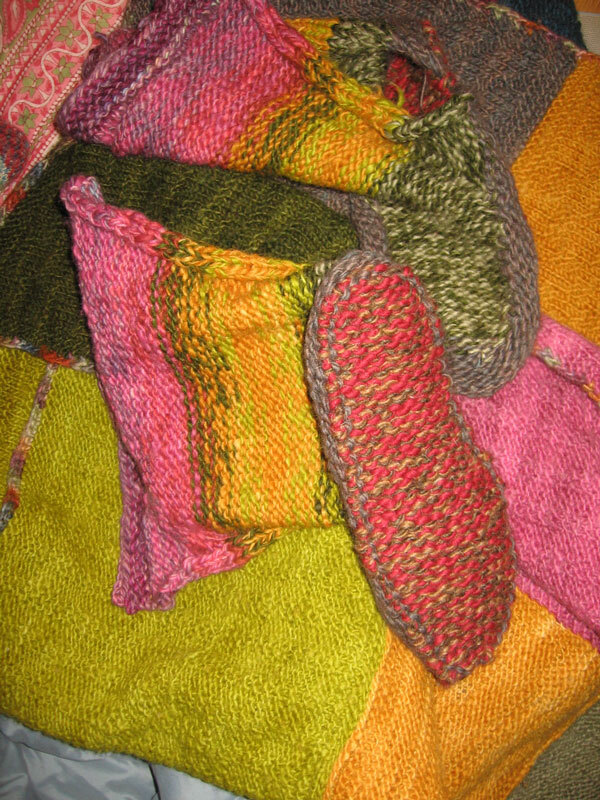 I didn’t want them to be too felted, but I wanted there to be enough felting so that the slippers were sturdy and durable. 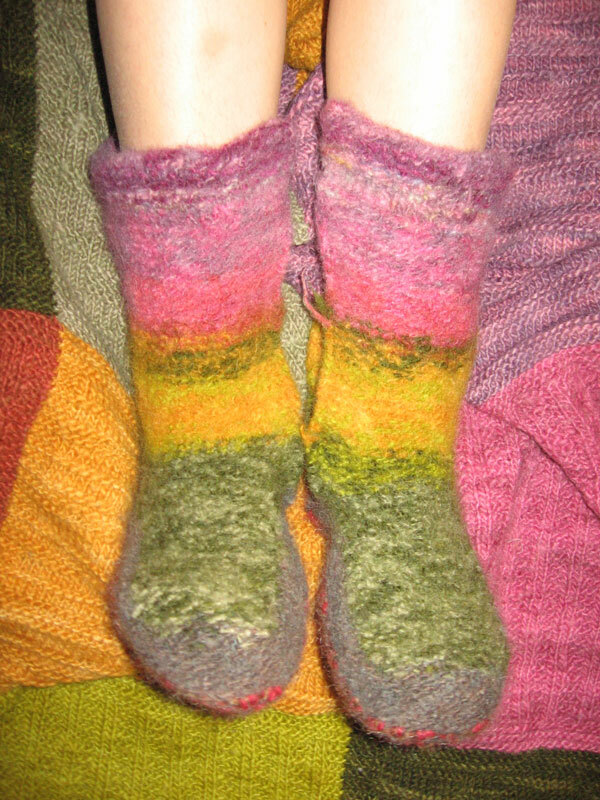 The soles didn’t felt as much as the tops, but since I knit them more densely to begin with they worked out okay. It is important to try the newly felted (and consequently soggy) slipper on before it dries. I like to make sure that the basic shape that I want is established, so the fibers dry as I would like. I decided to have the slipper have a slit all the way up the inside. I am not sure if I will put a zipper or buttons, or simply sew it up… so many possibilities! they are so cute!!! i definitely am jealous, you were right! i want some! mom got them…i think that it had something to do with the fact that it is her blanket too.. They are so pretty Torrey. I finished mine today. I felted them by hand. Took 2 hours. They turned out well except they are not the same size as eachother!! Oh well, live and learn, I can still wear them and they are really cozy. Now I am going to make my husband a pair. In fact I am going to head to your store shortly. Thanks for all your inspiration!